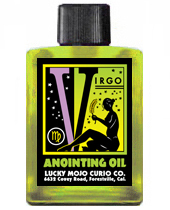 Virgo the Virgin: August 23 - September 22; Mutable Earth, ruled by Mercury. If you were born between August 23 and September 22, Virgo is your sign. 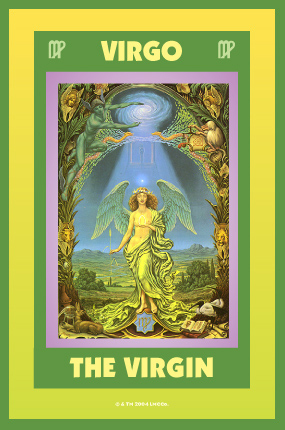 You have a calm, inquiring, and orderly mind. You could succeed as a lawyer, office manager, accountant, chemist, or janitor. Your love of honesty causes friends to have great confidence and trust in you, and you expect their respect and trust in return. You can adapt yourself to almost any kind of environment and gain financial success by careful attention to details. Overcome worries and you will rise much faster in your chosen field. Most of your health problems can be solved by carefully regulating your diet and hygiene. 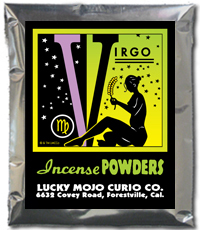 Find partners at work or in love in the signs Taurus and Capricorn. Your most fortunate day is Wednesday. Birthday -- August 23 - September 22. Keywords -- Modest, precise, accurate, and analytical. Anatomy -- The intestines and the spleen. 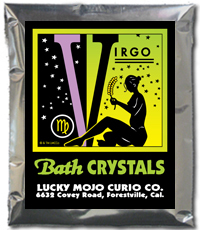 Order Virgo Oil from the Lucky Mojo Curio Co.
Order Virgo Incense from the Lucky Mojo Curio Co.
Order Virgo Bath Crystals from the Lucky Mojo Curio Co.
Order Virgo Sachet Powder from the Lucky Mojo Curio Co.
Order Virgo Vigil Light Candles from the Lucky Mojo Curio Co.